Gameloft is bound to attract plenty of attention this Thursday with the release of its first Unreal Engine-powered adventure, Wild Blood. Featuring impressive graphics that inch the mobile gaming world one step closer to having console quality visuals on smartphones and tablets, this action packed romp should turn plenty of heads. That said, we charged through the game's first couple of chapters to see what's in store for iOS and Android users. As far as the plot goes, Wild Blood takes place within the Camelot mythology. The once noble King Arthur finds out that his beloved Queen Guinevere had an affair with Sir Lancelot. Driven to despair and madness, Arthur commissions the evil sorceress, Morgana, to teach Lancelot a thing or two about feeling up another man's lady. Morgana, being diabolical, foolishly opens a Hell Gate, unleashing scores of demons upon the land of Albion. She also captures Guinevere, prompting Lancelot to set off to rescue her, cutting down the army of monsters in the process. 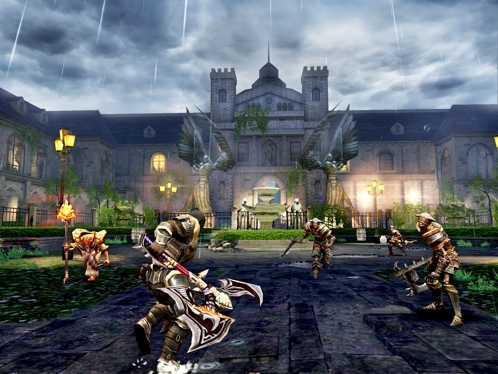 To that end, Gameloft doesn't hide the fact that Wild Blood provides a glorified hack-and slash experience. You don't match wits with Morgana in some intense card battle, or propel Lancelot via slingshot into a fort containing green pigs. Instead, you explore detailed environments mashing the attack button to slice and chop all sorts of ugly creatures to bits, whereupon which they explode, leaving behind gold coins and bars for Lancelot to grab. On that note, the developers break each chapter into bite-sized chunks, where the goal is to defeat all of the enemies to shatter some mysterious force field and then progress to the next area. Along the way, you'll locate keys to unlock doors, and kick open treasure chests to collect loot. However, this isn't as easy as it sounds. Some chests come with a puzzle to solve that involves rearranging blocks so that one square piece can pass through an opening. These get progressively more difficult the more you play, so expect a bit of head scratching in your quest to kill Morgana. As for the in-game action, the game doesn't break new ground, at least through the first couple of chapters. In addition to the attack button, there's also a skills button that instructs Lancelot to unleash a magic strike that also drains mana, and there appear to be different elemental types; fire versus ice, for example. The developers link these attacks to Lancelot's mana meter, where using one drains a huge chunk of it. Not only that, but the skill attacks have a cool down timer, forbidding you from using them repeatedly; thankfully, they charge quickly enough. Clearly, it's in your best interest to stock up on health and mana whenever possible. In regards to enemies, Lancelot faces all types, from lowly demons that crawl along the ground, to a humongous dragon and bird-like monsters that can fly. We also spied magicians of sorts, who attack from long range and temporarily paralyze Lancelot, leaving him wide open to attack. Naturally, you won't head into a fight unarmed. Lancelot begins the game with a sword, but we eventually unlocked twin axes. You may also spend coins to upgrade his overall damage, critical strikes, speed, fire, ice and lightning attacks; if you run out of coins, Gameloft will sell you more via in-app purchase. 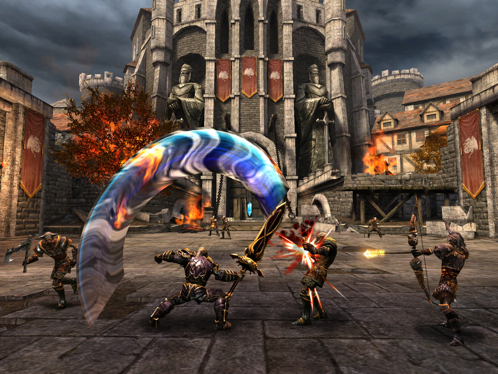 There also appears to be some variety to the gameplay, where the developers threw in a first-person crossbow sequence. Here, we had to slaughter a few waves of monsters by repeatedly tapping the fire button to shoot arrows at a rapid pace, doing our best to keep exploding enemies from getting too close to Lancelot. Last but not least, the graphics. We had extremely high expectations going into Wild Blood because of the Unreal Engine, and it appears Gameloft put it to good use, with destroyed villages, castles, cool lighting effects and plenty of character detail, especially when it comes to Lancelot's armor. Whether or not Wild Blood will become an iOS and Android favorite, though, remains to be seen. We'll have more on this promising title, including details on the online multiplayer mode, later this week.